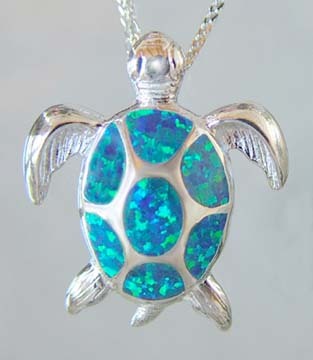 This gorgeous Inlaid Created Opal Sea Turtle Pendant is made of Sterling Silver with Inlaid Created Opal. Handcrafted with the finest details and materials, this piece of functional artwork will bring a lifetime of enjoyment. The pendant has a loop to place the pendant charm on any chain, a perfect gift for the sea turtle lovers. Velvet pouch and Gift Box Included! Pendant measure approximately 7/8" across, 1" in height. Hurry! Only 1 of this item is left in stock!